Western blot analysis of extracts from various cell lines using NEDD4L Antibody. 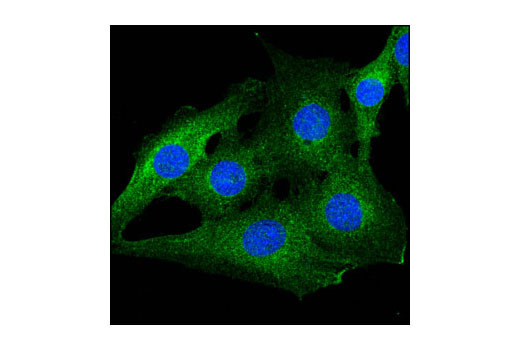 Confocal immunofluorescent analysis of C2C12 cells using NEDD4L Antibody (green). Blue pseudocolor = DRAQ5® #4084 (DNA fluorescent dye). 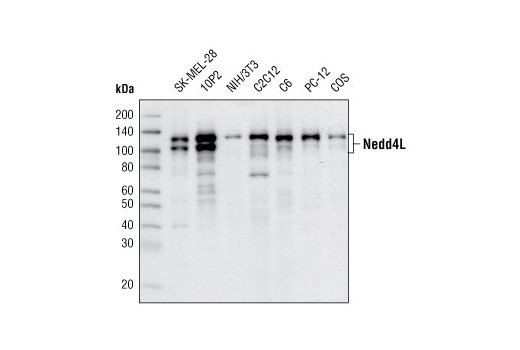 NEDD4L Antibody detects endogenous levels of total NEDD4L protein. Polyclonal antibodies are produced by immunizing animals with a synthetic peptide corresponding to residues surrounding Glu271 of human NEDD4L protein. Antibodies are purified by protein A and peptide affinity chromatography. Neural precursor expressed, developmentally down-regulated protein 4 (NEDD4) was originally identified as a gene that is highly expressed in the early mouse embryonic central nervous system (1). Subsequently, a family of NEDD4-like proteins have been defined that includes seven members in humans (2). NEDD4 and NEDD4-like (NEDD4L) proteins contain multiple functional domains including a calcium-dependent phospholipid and membrane binding domain (C2 domain), two to four protein binding domains (WW domains), and an E3 ubiquitin-protein ligase domain (HECT domain). NEDD4 and NEDD4L have been shown to downregulate both neuronal voltage-gated Na+ channels (NaVs) and epithelial Na+ channels (ENaCs) in response to increased intracellular Na+ concentrations (3,4). The WW domains of NEDD4 bind to PY motifs (amino acid sequence PPXY) found in multiple NaV and ENaC proteins; ubiquitination of these proteins is mediated by the HECT domain of NEDD4 and results in their internalization and removal from the plasma membrane. Research studies have shown that mutation of the PY motifs in ENaC proteins is associated with Liddle's syndrome, an autosomal dominant form of hypertension (5). In addition to targeting sodium channels, NEDD4L has also been shown to negatively regulate TGF-β signaling by targeting Smad2 for degradation (6). Mouse and human NEDD4 are rapidly cleaved by caspase proteins during apoptosis, although the significance of this cleavage is not clear (7). Kumar, S. et al. (1992) Biochem Biophys Res Commun 185, 1155-61. Harvey, K.F. and Kumar, S. (1999) Trends Cell Biol 9, 166-9. Dinudom, A. et al. (1998) Proc Natl Acad Sci USA 95, 7169-73. Goulet, C.C. et al. (1998) J Biol Chem 273, 30012-7. Staub, O. et al. (1996) EMBO J 15, 2371-80. Kuratomi, G. et al. (2005) Biochem J 386, 461-70. Harvey, K.F. et al. (1998) J Biol Chem 273, 13524-30.